The development priorities of developing countries include achieving sustained income growth for their economies by raising investment rates, strengthening technological capacities and skills, and improving the competitiveness of their exports in world markets; distributing the benefits of growth equitably by creating more and better employment opportunities; and protecting and conserving the physical environment for future generations. The new, more competitive, context of a liberalizing and globalizing world economy in which economic activity takes place imposes considerable pressures on developing countries to upgrade their resources and capabilities if they are to achieve these objectives. This new global context is characterized by rapid advances in knowledge, shrinking economic space and rapid changes in competitive conditions, evolving attitudes and policies, and more vocal (and influential) stakeholders. A vital part of the new context is the need to improve competitiveness, defined as the ability to sustain income growth in an open setting. In a liberalizing and globalizing world, growth can be sustained only if countries can foster new, higher value-added activities, to produce goods and services that hold their own in open markets. FDI and international production by TNCs can play an important role in complementing the efforts of national firms in this respect. However, the objectives of TNCs differ from those of host governments: governments seek to spur national development, while TNCs seek to enhance their own competitiveness in an international context. In the new context, TNCs’ ownership advantages are also changing. In particular, rapid innovation and deployment of new technologies, in line with logistic and market demands, are more important than ever before (figure 6). Thus, TNCs have to change their relations with suppliers, buyers and competitors to manage better the processes of technical change and innovation. And they have to strike closer links with institutions dealing with science, technology, skills and information. The spread of technology to, and growth of skills in, different countries means that new TNCs are constantly entering the arena to challenge established ones. A striking feature of the new environment is how TNCs shift their portfolios of mobile assets across the globe to find the best match with the immobile assets of different locations. In the process, they also shift some corporate functions to different locations within internationally integrated production and marketing systems (intensifying the process of “deep integration”). The ability to provide the necessary immobile assets thus becomes a critical part of an FDI — and competitiveness — strategy for developing countries. While a large domestic market remains a powerful magnet for investors, TNCs serving global markets increasingly look for world-class infrastructure, skilled and productive labour, innovatory capacities and an agglomeration of efficient suppliers, competitors, support institutions and services. In addition, they may also seek to acquire created assets embodied in competitive host country firms, which may lead to a restructuring of these firms not necessarily beneficial for host countries. Low-cost labour remains a source of competitive advantage for countries, but its importance is diminishing; moreover, it does not provide a base for sustainable growth since rising incomes erode the edge it provides. The same applies to natural resources. … and meeting them requires policy intervention. There is no conflict between exploiting static sources of comparative advantage and developing new, dynamic ones; existing advantages provide the means by which new advantages can be developed. A steady evolution from one to the other is the basis for sustained growth. What is needed is a policy framework to facilitate and accelerate the process: this is the essence of a competitiveness strategy. The need for such strategy does not disappear once growth accelerates, or economic development reaches a certain level; it merely changes its form and focus. This is why competitiveness remains a concern of governments in developing and developed countries alike. The starting point for this concern is that providing a level playing field and letting firms respond to market signals is sufficient only to the extent that markets work efficiently. The very existence of TNCs is a manifestation that this is not always the case. In the presence of market failures, e.g. when markets fail to exploit existing endowments fully, fail to develop new competitive advantages, or do not give the correct signals to economic agents so that they can make proper investment decisions, intervention is necessary — provided governments have the capabilities to design, monitor and implement policies that overcome market failures. More specifically, government policies on FDI need to counter two sets of market failures. The first arises from information or coordination failures in the investment process, which can lead a country to attract insufficient FDI, or the wrong quality of FDI. The second arises when private interests of investors diverge from the economic interests of host countries. This can lead FDI to have negative effects on development, or it may lead to positive, but static benefits that are not sustainable over time. Private and social interests may, of course, diverge for any investment, local or foreign: policies are then needed to remove the divergence for all investors. However, some divergence may be specific to foreign investment. FDI may differ from local investment because the locus of decisionmaking and sources of competitiveness in the former lie abroad, because TNCs pursue regional or global competitiveness-enhancing strategies, or because foreign investors are less committed to host economies and are relatively mobile. Thus, the case for intervening with FDI policies may have a sound economic basis. In addition, countries consider that foreign ownership has to be controlled on non-economic grounds — for instance, to keep cultural or strategic activities in national hands. The role of FDI in countries’ processes and efforts to meet development objectives can differ greatly across countries, depending on the nature of the economy and the government. One vision — pursued, for example, by Malaysia, Singapore and Thailand — was to rely substantially on FDI, integrating the economy into TNC production networks and promoting competitiveness by upgrading within those networks. Another vision — pursued by the Republic of Korea and Taiwan Province of China — was to develop domestic enterprises and autonomous innovative capabilities, relying on TNCs mainly as sources of technology, primarily at arm’s length. Yet another, that of the administration of Hong Kong (China), was to leave resource allocation largely to market forces, while providing infrastructure and governance. There is no ideal development strategy with respect to the use of FDI that is common for all countries at all times. Any good strategy must be context specific, reflecting a country’s level of economic development, the resource base, the specific technological context, the competitive setting, and a government’s capabilities to implement policies (see box 1). Most developing countries today consider FDI an important channel for obtaining access to resources for development. However, the economic effects of FDI are almost impossible to measure with precision. Each TNC represents a complex package of firm-level attributes that are dispersed in varying quantities and quality from one host country to another. These attributes are difficult to separate and quantify. Where their presence has widespread effects, measurement is even more difficult. There is no precise method of specifying a counter-factual – what would have happened if a TNC had not made a particular investment. 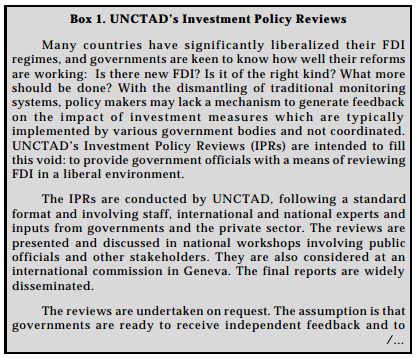 Thus, the assessment of the development effects of FDI has to resort either to an econometric analysis of the relationships between inward FDI and various measures of economic performance, the results of which are often inconclusive, or to a qualitative analysis of particular aspects of the contribution of TNCs to development, without any attempt at measuring costs and benefits quantitatively. FDI comprises a bundle of assets, some proprietary to the investor. The proprietary assets, the “ownership advantages” of TNCs, can be obtained only from the firms that create them. They can be copied or reproduced by others, but the cost of doing that can be very high, particularly in developing countries and where advanced technologies are involved. Non-proprietary assets – finance, many capital goods, intermediate inputs and the like – can usually be obtained from the market also. The most prized proprietary asset is probably technology. 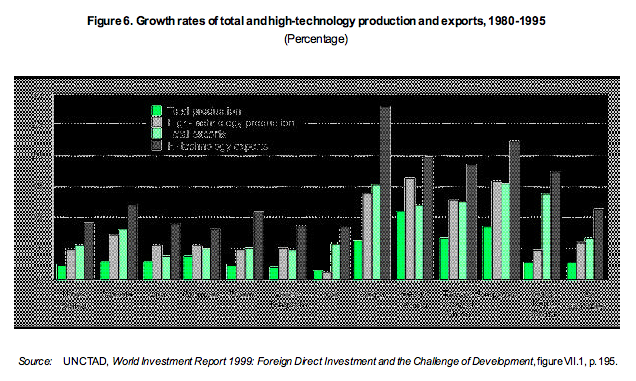 Capital: FDI brings in investible financial resources to host countries (figure 7). 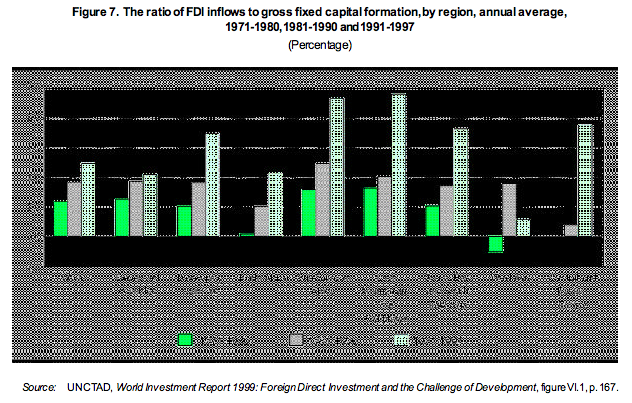 FDI inflows are more stable and easier to service than commercial debt or portfolio investment. In distinction to other sources of capital, TNCs typically invest in long-term projects. Technology: TNCs can bring modern technologies, some of them not available in the absence of FDI, and they can raise the efficiency with which existing technologies are used. They can adapt technologies to local conditions, drawing upon their experience in other developing countries. They may, in some cases, set up local R&D facilities. They can upgrade technologies as innovations emerge and consumption patterns change. They can stimulate technical efficiency and technical change in local firms, suppliers, clients and competitors, by providing assistance, by acting as role models and by intensifying competition. 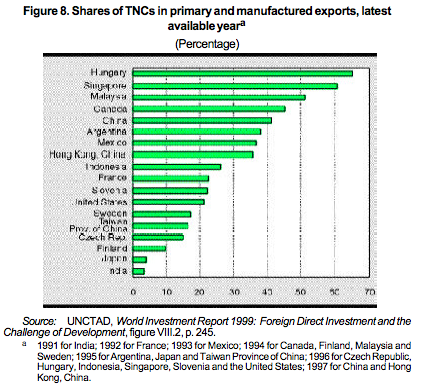 Market access: TNCs can provide access to export markets, both for goods (and some services) that are already produced in host countries, helping them switch from domestic to international markets; and for new activities that exploit a host economy’s comparative advantages (figure 8). The growth of exports itself offers benefits in terms of technological learning, realization of scale economies, competitive stimulus and market intelligence. Skills and management techniques: TNCs employ and have world-wide access to individuals with advanced skills and knowledge and can transfer such skills and knowledge to their foreign affiliates by bringing in experts and by setting up state-of-the-art training facilities. Improved and adaptable skills and new organizational practices and management techniques can yield competitive benefits for firms as well as help sustain employment as economic and technological conditions change. Environment: TNCs are in the lead in developing clean technologies and modern environmental management systems. They can use them in countries in which they operate. Spillovers of technologies and management methods can potentially enhance environmental management in local firms within the industries that host foreign affiliates. While TNCs offer the potential for developing countries to access these assets in a package, this does not necessarily mean that simply opening up to FDI is the best way of obtaining or benefiting from them. The occurence of market failures mentioned above means that governments may have to intervene in the process of attracting FDI with measures to promote FDI generally or measures to promote specific types of FDI. Furthermore, the complexity of the FDI package means that governments face trade-offs between different benefits and objectives. Information and coordination failures in the international investment process. Infant industry considerations in the development of local enterprises, which can be jeopardized when inward FDI crowds out those enterprises. The static nature of advantages transferred by TNCs where domestic capabilities are low and do not improve over time, or where TNCs fail to invest sufficiently in raising the relevant capabilities. Weak bargaining and regulatory capabilities on the part of host country governments, which can result in an unequal distribution of benefits or abuse of market power by TNCs. High transaction costs. While most FDI regimes are converging on a similar set of rules and incentives, there remain large differences in how these rules are implemented. The FDI approval process can take several times longer, and entail costs many times greater in one country than in another with similar policies. After approval, the costs of setting up facilities, operating them, importing and exporting goods, paying taxes and generally dealing with the authorities can differ enormously. Such costs can, other things being equal, affect significantly the competitive position of a host economy. An important part of a competitiveness strategy thus consists of reducing unnecessary, distorting and wasteful business costs, including, among others, administrative and bureaucratic costs. This affects both local and foreign enterprises. However, foreign investors have a much wider set of options before them, and are able to compare transaction costs in different countries. Thus, attracting TNCs requires not just that transaction costs be lowered, but also, increasingly, that they be benchmarked against those of competing host countries. One important measure that many countries take to ensure that international investors face minimal costs is to set up one-stop promotion agencies able to guide and assist them in getting necessary approvals. However, unless the agencies have the authority needed to provide truly one-stop services, and unless the rules themselves are clear and straightforward, this may not help. Despite their size and international exposure, TNCs face market failures in information. Their information base is far from perfect, and the decision-making process can be subjective and biased. Taking economic fundamentals as given, it may be worthwhile for a country that receives lower FDI than desired to invest in establishing a distinct image of its own and, if necessary, attempt to alter the perception of potential investors by providing more and better information. Such promotion efforts are highly skill-intensive and potentially expensive, and they need to be mounted carefully to maximize their impact. Investor targeting — general, industry-specific or company specific – could be a costeffective approach in some cases. Targeting or information provision is not the same as giving financial or fiscal incentives. In general, incentives play a relatively minor role in a good promotion programme, and good, long-term investors are not the ones most susceptible to short-term inducements. The experiences of Ireland, Singapore – and, more recently, Costa Rica — suggest that promotion and targeting can be quite effective in raising the inflow of investment and its quality. Effective promotion should go beyond simply “marketing a country”, into coordinating the supply of a country’s immobile assets with the specific needs of targeted investors. This addresses potential failures in markets and institutions — for skills, technical services or infrastructure — in relation to the specific needs of new activities targeted via FDI. A developing country may not be able to meet, without special effort, such needs, particularly in activities with advanced skill and technology requirements. The attraction of FDI into such industries can be greatly helped if a host government discovers the needs of TNCs and takes steps to cater to them. The information and skill needs of such coordination and targeting exceed those of investment promotion per se, requiring investment promotion agencies to have detailed knowledge of the technologies involved (skill, logistical, infrastructural, supply and institutional needs), as well as of the strategies of the relevant TNCs. … that also minimize the adverse effects on domestic enterprise development. Domestic enterprise development is a priority for all developing countries. In this regard, the possible ”crowding out” of domestic firms by foreign affiliates is frequently an issue of concern. Crowding out due to FDI could occur in two ways: first, in the product market, by adversely affecting learning and growth by local firms in competing activities; second, in financial or other factor markets, by reducing the availability of finance or other factors, or raising costs for local firms, or both. The first issue reflects “infant industry” considerations, but without the usual connotation of protecting new activities against import competition. It concerns the fostering of learning in domestic firms vis-à-vis foreign firms. FDI can abort or distort the growth of domestic capabilities in competing firms when direct exposure to foreign competition prevents local enterprises from undertaking lengthy and costly learning processes. Foreign affiliates also undergo learning locally to master and adapt technologies and train employees in new skills. However, they have much greater resources to undertake this learning, and considerably more experience of how to go about learning in different conditions. In these cases, “crowding out” can be said to occur if potentially competitive local firms cannot compete with affiliates at a given point in time. The case for domestic enterprise protection differs from the infant industry argument for trade protection. When trade protection is eliminated, consumers benefit from cheaper imports and greater product variety; but some domestic production and employment can be lost. In contrast, in the case of local enterprise protection, the absence of such protection from FDI competition does not lead to loss of domestic production and employment in exchange for enhancing consumer benefits; but, indigenous entrepreneurial development may be hampered, particularly in sophisticated activities. The net cost of this is that linkages may be fewer and technological deepening may be inhibited. As with all infant industry arguments, crowding out is economically undesirable if three conditions are met. First, infant local enterprises are able to mature to full competitiveness if sheltered against foreign competition that takes place through (in this case) FDI. Second, the maturing process does not take so long that the discounted present social costs outweigh the social benefits. Third, even if there are social costs, there must be external benefits that outweigh them. Crowding out can impose a long-term cost on the host economy if it holds back the development of domestic capabilities or retards the growth of a local innovative base. This can make technological upgrading and deepening dependent on decisions taken by TNCs, and in some cases hold back the host economy at lower technological levels than would otherwise be the case. However, it is important to distinguish between affiliates crowding out potentially efficient domestic enterprises and affiliates outcompeting inefficient local firms that cannot achieve full competitiveness. One of the benefits of FDI can be the injection of new technologies and competition that leads to the exit of inefficient enterprises and the raising of efficiency in others. Without such a process, the economy can lack dynamism and flexibility, and can lose competitiveness over time, unless competition between local firms in the domestic market is intense, or they face international competition (say, in export markets). TNCs, however, can also “crowd in” local firms if they strike up strong linkages with domestic suppliers, subcontractors and institutions. Crowding in can take place when foreign entry increases business opportunities and local linkages, raises investible resources or makes factor markets more efficient. Such stimulating effects are most likely when FDI concentrates in industries that are undeveloped in (or new to) host countries. Where local firms are well developed, but still face difficulties in competing with foreign affiliates, there can be harmful crowding out. However, local firms can also become suppliers to TNCs, or be taken over by them, as discussed below. A second variety of crowding out reflects an uneven playing field for domestic firms because of a segmentation in local factor markets: TNCs may have privileged access to factors such as finance (which may give them a special advantage especially vis-à-vis local firms) and skilled personnel because of their reputation and size. They can thus raise entry costs for local firms, or simply deprive them of the best factor inputs. Both forms of crowding out raise policy concerns. Most governments wish to promote local enterprises, particularly in complex and dynamic industrial activities. Many feel that the deepening of capabilities in local firms yields greater benefits than receiving the same technologies from TNCs: linkages with local suppliers are stronger, there is more interaction with local institutions, and where innovatory activities take place, knowledge developed within firms is not “exported” to parent companies and exploited abroad, and so on. The few developing economies that have developed advanced indigenous technological capabilities have restricted the entry of FDI (generally, or into specific activities). The possession of a strong indigenous technology base is vital not just for building the competitiveness of local enterprises – it is also important for attracting high-technology FDI and for R&D investments by TNCs. At the same time, there are risks in restricting FDI per se to promote local enterprises. For one thing, it is very difficult in practice to draw the distinction between crowding out and legitimate competition. If policy makers cannot make this distinction, they may prop up uneconomic local firms for a long period, at heavy cost to domestic consumers and economic growth. The danger of technological lags if TNCs are kept out of sophisticated activities in a country is much greater now than, say, several decades ago. So is the risk of being unable to enter export markets for activities with high product differentiation and internationally integrated production processes. It is important however, to strengthen the opportunities for domestic firms to crowd in after the entry of FDI by building up local capabilities and a strong group of small- and medium-sized domestic firms that could develop linkages with foreign affiliates. The right balance of policies between regulating foreign entry and permitting competition depends on the context. Only a few developing countries have built impressive domestic capabilities and world-class innovative systems while restricting the access of TNCs. Some others have restricted foreign entry, but have not succeeded in promoting competitive domestic enterprises in hightechnology manufacturing activities. Success clearly depends on many other things apart from sheltering learning, including the availability of complementary resources and inputs, the size of the domestic market and the competitive climate in which learning takes place. In sum, the infant enterprise argument remains valid, and can provide a case for policy intervention to promote local capability development, but interventions have to be carefully and selectively applied, monitored, and reversed where necessary. Similar considerations to those highlighted above apply to M&As of local firms by TNCs, including privatization by sale of state enterprises to foreign investors, a common form of foreign entry into Latin America and Central and Eastern Europe, and more recently into developing Asian countries affected by the financial crisis. Some M&As that entail a simple change of ownership akin to portfolio investment can be of lesser developmental value. Some take-overs lead to asset stripping, and large M&A-related inflows can become large outflows when investments are liquidated, possibly giving rise to exchange rate volatility and discouraging productive investment. There may also be adverse effects on local innovatory capacity and competitiveness in trade as illustrated by the acquisition of firms in the automotive and telecommunications industries of Brazil by TNCs. These resulted in a scaling down of R&D activities in the acquired firms. Reduced reliance by Brazilian firms acquired by TNCs on locally produced high-technology inputs also led to increased import penetration in areas such as in automobile parts and components, information technology and telecommunication products. Many countries, including developed ones, are also concerned about the adverse impact of M&As on employment. M&As can also have anti-competitive effects if they reduce substantially the number of competitors in a domestic market, especially for non-tradable products such as most services. M&As may also yield economic benefits, however. Where the investor makes a long-term commitment to the acquired firm and invests in upgrading and restructuring its technology and management, the impact is very similar to a greenfield investment. In Thailand, for instance, in the context of the recent financial crisis, a number of M&As in the automobile industry are leading to restructuring and increased competitiveness, manifested by increases in commercial vehicle exports. FDI related to M&As can play an important role in modernizing privatized utilities such as telecommunications and public utilities, as is the case in some instances in Latin America. Foreign acquisitions can prevent viable assets of local firms from being wiped out; this can be particularly important in economies in transition and financially distressed developing countries. The benefits of M&As (including in the context of privatization) depend on the circumstances of a country and the conditions under which enterprises are acquired and subsequently operated. However, there may be value in monitoring M&As, instituting effective competition policies, and placing limits on them when the macroeconomic situation justifies it. This raises the question of the effects of FDI on market structure in host countries. There has been a long-standing concern that the entry of large TNCs raises concentration levels within an economy and can lead to the abuse of market power. TNCs tend to congregate in concentrated industries. Whether this leads to the abuse of market power is an empirical question requiring further research. If host economies have liberal trade regimes, the danger of anti-competitive behaviour in such structures is largely mitigated. However, it remains true that effective competition policy becomes more and more important in a world in which large TNCs can easily dominate an industry in a host country. Many important issues concerning the benefits of FDI for technology acquisition and technological capacity-building, skills development and competitiveness revolve around its static versus dynamic effects. TNCs can be efficient vehicles for the transfer of technologies and skills suited to existing factor endowments in host economies. They provide technology at very different levels of scale and complexity in different locations, depending on market orientation and size, labour skills available, technical capabilities and supplier networks. Where the trade regime in host (and home) countries is conducive (and infrastructure is adequate), they can use local endowments effectively to expand exports from host countries. This can create new capabilities in the host economies and can have beneficial spillover effects. In low-technology assembly activities, the skills and linkage benefits may be low; in high-technology activities, however, they may be considerable. Unless they operate in highly protected regimes, pay particularly low wages (as in some export processing zones in low-skill assembly), or benefit from expensive infrastructure while paying no taxes, there is a strong presumption that FDI contributes positively to using host country resources efficiently and productively. In this context, one of the main benefits of TNCs to export growth is not simply their ability to provide the technology and skills to complement local resources, or labour to produce for export, but to provide access to foreign markets. TNCs are increasingly important players in world trade. They have large internal (intrafirm) markets for some of the most dynamic and technologyintensive products, access to which is available only to affiliates. They have established brand names and distribution channels with supply facilities spread over several national locations. They can influence the granting of trade privileges in their home (or in third) markets. All these factors mean that they might offer considerable advantages in creating an initial export base for new entrants. The development impact of FDI, however, also depends on the dynamics of the transfer of technology and skills by TNCs: how much upgrading of local capabilities takes place over time, how far local linkages deepen, and how closely affiliates integrate themselves in the local learning system (see, as an illuatration, table 7). TNCs may simply exploit the existing advantages of a host economy and move on as those advantages erode. Static advantages may not automatically transmute into dynamic advantages. This possibility looms particularly large where a host economy’s main advantage is low-cost unskilled labour, and the main TNC export activity is low-technology assembly. The extent to which TNCs dynamically upgrade their technology and skills transfer and raise local capabilities and linkages depends on the interaction of the trade and competition policy regime, government policies on the operations of foreign affiliates, the corporate strategies and resources of TNCs, and the state of development and responsiveness of local factor markets, firms and institutions. The trade and competition policy regime in a host economy may provide the encouragement for enterprises, local and foreign, to invest in developing local capabilities. In general, the more competitive and outward-oriented a regime, the more dynamic is the upgrading process. A highly protected regime, or a regime with stringent constraints on local entry and exit, discourages technological upgrading, isolating the economy from international trends. This is not to say that completely free trade is the best setting. Infant industry considerations suggest that some protection of new activities can promote technological learning and deepening. However, even protected infants must be subjected to the rigours of international competition fairly quickly – otherwise they will never grow up. This applies to foreign affiliates, as well as to local firms. A strongly export-oriented setting with appropriate incentives provides the best setting for rapid technological upgrading. The second factor concerns policies regarding the operations of foreign affiliates, including local-content requirements, incentives for local training or R&D, and pressures to diffuse technologies. The results of the use of such policies have often been poor when they were not integrated into a wider strategy for upgrading capabilities. However, where countries have used them as part of a coherent strategy, as in the mature newly-industrializing economies, the results have often been quite beneficial: foreign affiliates enhanced the technology content of their activities and of their linkages to local firms, which were supported in raising their efficiency and competitiveness. Much of the effort by foreign affiliates to upgrade local capabilities involves extra cost, and affiliates will not necessarily undertake this effort unless it is cost effective and suits their long-term objectives. For the host economy, it is worth doing so only if it leads to efficient outcomes. If upgrading is forced beyond a country’s capabilities, it will not survive in a competitive and open environment. The third factor involves TNC strategies. Corporate strategies differ in the extent to which they assign responsibility to different affiliates and decide their position in the corporate network. TNCs are changing their strategies in response to technological change and policy liberalization, and much of this is outside the scope of influence of developing host countries. Nevertheless, host country governments can influence aspects of TNC location decisions by measures such as targeting investors, inducing upgrading by specific tools and incentives and improving local factors and institutions. This requires them to have a clear understanding of TNC strategies and their evolution. The fourth factor, the state and responsiveness of local factor markets, firms and institutions, is probably the most important one. TNCs upgrade their affiliates where it is cost-efficient to do so. Moreover, since firms in most industries prefer their suppliers to be nearby, they will deepen local linkages if local suppliers can respond to new demands efficiently. Both depend upon the efficacy and development of local skills and technological capabilities, supplier networks and support institutions. Without improvements in factor markets, TNCs can improve the skills and capabilities of their employees only to a limited extent. They do not compensate for weaknesses in the local education, training and technology system. In the absence of rising skills and capabilities generally, it would be too costly for them to import advanced technologies and complex, linkage-intensive operations.At the same time, there are risks that the presence of TNCs inhibits technological development in a host economy. TNCs are highly efficient in transferring the results of innovation performed in developed countries, but less so in transferring the innovation process itself. While there are some notable exceptions, foreign affiliates tend to do relatively little R&D. This may be acceptable for a while in the case of countries at low levels of industrial development, but can soon become a constraint on capability building as countries need to develop autonomous innovative capabilities. 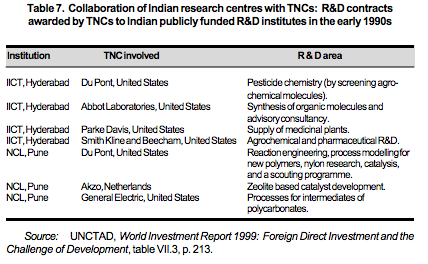 Once host countries build strong local capabilities, TNCs can contribute positively by setting up R&D facilities. However, at the intermediate stage, the entry of large TNCs with ready-made technologies can inhibit local technology development, especially when local competitors are too far behind to gain from their presence. Where a host economy adopts a proactive strategy to develop local skills and technology institutions, it may be able to induce TNCs to invest in local R&D even if there is little research capability in local firms. The appropriate policy response is not to rule out FDI, but to channel it selectively so that local learning is protected and promoted. In countries that do not restrict FDI, it is possible to induce advanced TNC technological activity by building skills and institutions. … as well as strong bargaining capabilities, regulatory regimes and policy-making capacity. In some cases, the outcome of FDI depends significantly on how well a host economy bargains with international investors. However, the capacity of developing host countries to negotiate with TNCs is often limited. The negotiating skills and information available to TNCs tend to be of better quality. With growing competition for TNC resources, the need of many developing countries for the assets TNCs possess is often more acute than the need of TNCs for the locational advantages offered by a specific country. In many cases, particularly in export-oriented investment projects where natural resources are not a prime consideration, TNCs have several alternative locations. Host countries may also have alternative foreign investors, but they are often unaware of them. Where the outcome of an FDI project depends on astute bargaining, developing host countries may sometimes do rather poorly compared to TNCs. The risk is particularly great for major resource-extraction projects or the privatization of large public utilities and other companies. Considerable bargaining also takes place in large manufacturing projects where incentives, grants and so on are negotiated on a case-by-case basis. Though the general trend is towards non-discretionary incentives, considerable scope for bargaining still exists, and developing countries tend to be at a disadvantage in this respect. To strengthen developing countries’ bargaining capabilities, legal advice is often required, but the costs of obtaining such advice are usually prohibitive, especially for least developed countries. Establishing a pilot facility that would help ensure that expert advice in contract negotiations is more readily available to developing countries is worth considering. Such a facility would benefit not only developing host countries, but also TNCs by reducing specific transaction costs in the process of negotiations (for instance, by reducing the risk of delays) and, more generally, by leading to more stable and lasting contracts. To return to the regulatory framework: with liberalization and globalization, there are fewer policy tools available to countries left to influence the conduct of foreign and local firms. The capacities of host developing countries to regulate enterprises in terms of competition policy and environment policy are emerging as the most active policy-making areas. An effective competition policy is therefore an absolute necessity. However, most developing countries lack such policy. Mounting a competition policy is a complex task requiring specialized skills and expertise that are often scarce in developing countries. It is important for host countries to start the process of developing these skills and expertise, especially if large TNCs with significant market power are attracted to their markets. Similar concerns arise with respect to the environment. Many developing host countries have only limited regulations on the environment, and often lack the capacity to enforce them effectively. TNCs are often accused of exploiting these in order to evade tougher controls in the developed world. Some host developing countries are accused of using lax enforcement to attract FDI in pollutionintensive activities. The evidence on the propensity of TNCs to locate their investments in order to evade environmental regulations is, however, not conclusive. TNCs are usually under growing pressure to conform to high environmental standards from home country environmental regulations, consumers, environment groups and other “drivers” in the developed and developing world. Many see environment management not only as necessary, but also as commercially desirable. However, it is up to host governments to ensure that all TNCs and domestic firms follow the examples set by the “green” TNCs. Another important regulatory problem is that of transfer pricing to evade taxes or restrictions on profit remission. TNCs can use transfer pricing over large volumes of trade and service transactions. The problem is not restricted to dealings between affiliates; it may also arise in joint ventures. However, it may well be that the deliberate abuse of transfer pricing has declined as tax rates have fallen and full profit remittances are allowed in much of the developing world. Double-taxation treaties between host and home countries have also lowered the risk of transfer-pricing abuses. However, this problem still remains a widespread concern among developed and developing countries. Tackling it needs considerable expertise and information. Developing country tax authorities are generally poorly equipped to do this, and can benefit greatly from technical assistance and information from developed-country governments in this area. 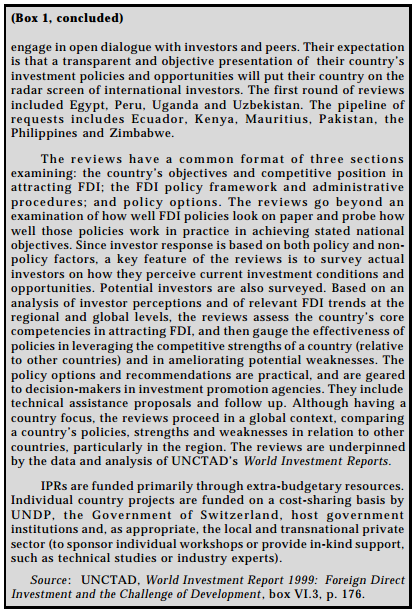 Managing FDI policy effectively in the context of a broader competitiveness strategy is a demanding task. A passive, laissez faire approach is unlikely to be sufficient because of failures in markets and deficiencies in existing institutions. Such an approach may not attract sufficient FDI, extract all the potential benefits that FDI offers, or induce TNCs to operate by best-practices standards. However, a laissez faire FDI strategy may yield benefits in host countries that have under-performed in terms of competitiveness and investment attraction because of past policies. Such a strategy sends a strong signal to the investment community that the economy is open for business. FDI will be attracted into areas of existing comparative advantage. However, there are two problems. First, if attractive locational assets are limited, or their use is held back by poor infrastructure or non-economic risk, there will be little FDI response. Second, even if FDI enters, its benefits are likely to be static and will run out when existing advantages are used up. To ensure that FDI is sustained over time and enters new activities requires policy intervention, both to target investors and to raise the quality of local factors. Needless to say, for the great majority of countries the form of intervention has to be different from traditional patterns of heavy inward-orientation and market-unfriendly policies – it has to be aimed at competitiveness. What all this suggests is that there is no ideal universal strategy on FDI. Any strategy has to suit the particular conditions of a country at any particular time, and evolve as the country’s needs and its competitive position in the world change. Increasingly, it also has to take into account the fact that international investment agreements set parameters for domestic policy making. Governments of developing countries need to ensure, therefore, that such agreements do leave them the policy space they require to pursue their development strategies. Formulating and implementing an effective strategy requires above all a development vision, coherence and coordination. It also requires the ability to decide on trade-offs between different objectives of development. In a typical structure of policy making, this requires the FDI strategy-making body to be placed near the head of government so that a strategic view of national needs and priorities can be formed and enforced. In conclusion, TNCs are principal drivers of the globalization process, which defines the new context for development. In this context, there is more space for firms to pursue their corporate strategies, and enjoy more rights than before. The obvious question is: should these increased rights be complemented by firms’ assuming greater social responsibility? The notion of social responsibility of TNCs encompasses a broad range of issues of which environmental, human and labour rights have attracted most attention in recent years. In a liberalizing and globalizing world economy, this question is likely to be asked with increasing frequency and insistence. In his Davos speech in January 1999, the Secretary-General of the United Nations initiated the discussions on this question by proposing a global compact. Perhaps they could be intensified in the framework of a more structured dialogue between all parties concerned. Development would have to be central to this dialogue, as this is the overriding concern of the majority of humankind and because it is, in any event, intimately linked to the social, environmental and human rights objectives that lead the agenda in this area. The dialogue could build on the proposal of a global compact made by the Secretary-General, with a view towards examining how, concretely, the core principles already identified, as well as development considerations, could be translated into corporate practices. After all, companies can best promote their social responsibilities by the way they conduct their own businesses and by the spread of good corporate practices. The world today is more closely knit, using different means of organization, communication and production, and is more subject to rapid change than ever before. At the same time, the past 30 years show striking – and growing – differences between countries in their ability to compete and grow. They also show how markets by themselves are not enough to promote sustained and rapid growth: policies matter, as do the institutions that formulate and implement them. There is an important role for government policies, but not in the earlier mould of widespread intervention behind protective barriers. Rather, in a globalizing world economy, governments increasingly need to address the challenge of development in an open environment. FDI can play a role in meeting this challenge. Indeed, expectations are high, perhaps too high, as to what FDI can do. But it seems clear that if TNCs contribute to development – and do so significantly and visibly – the relationship that has emerged between host country governments, particularly in developing countries, and TNCs over the past 15-20 years can develop further with potential benefits for all concerned. The new competitive context raises new challenges for governments and TNCs … … and meeting them requires policy intervention. FDI comprises a package of resources … … the benefits of which can be reaped through policy measures … … that also minimize the adverse effects on domestic enterprise development. Positive dynamic FDI effects on host countries require appropriate skills and policies, … … as well as strong bargaining capabilities, regulatory regimes and policy-making capacity.